With Spring just around the corner now is the time to make up some extra nuc boxes for splits and swarms. You can never have enough nuc boxes when the bees start to multiply! To Insulate and To Ventilate? Or Not. OK, I’m going to go ahead and fall on this grenade. The question is whether or not to ventilate your hives or to insulate them. There is a common belief that insulating or over-insulating hives is a bad thing. This seems to be based on some field studies years ago that found winter survival rates higher with some non-insulated hives. Maybe the study was flawed. In any case I have tried a lot of different configurations and I have looked at this pretty hard for a long time. The related issue is ventilation. Open or screened bottom boards and hive covers cracked open are a common prescription in the beekeeping world. Testimonies abound on the benefits of screened bottom boards. My experience is that solid bottom boards are a better way to go. My friends at Bees by the Bay, Harford Honey and Deer Creek Apiaries are all moving to solid bottom boards. Hollow trees don’t have open bottoms, vented covers, or upper entrances. Victor Croker at Australian Honey Company runs 600 production hives in polystyrene hives — and he does not crack open the lids. Honey production is 33% higher than in similar wooden hives under the same conditions. To hear some details on his views regarding insulation (especially in summer) listen in on Kiwimana Buzz podcast #084. I have had excellent results overwintering hives in a horse barn, opening the big barn doors on nice days for the bees to fly in and out. When spring approached (in March) I moved the hives out to other apiary sites. Screened bottom boards make it easy for small hive beetles to propagate. Canadians have to insulate their hives and pack them in 4-packs on pallets for the winter. They cannot depend on Georgia package replacements as the U. S. border is closed to bees. Some big outfits even downsize their whole operation into 5 frame, dense, polystyrene boxes and move to the southern border for the winter. Europeans in eastern countries keep their bees in bee houses and in bee house trailers – for protection from wind and cold. And to move to nectar flows. We don’t open up a gap in the roof of our house in the summer when we have air conditioning going on inside, right? Bees air condition their hives by evaporating water inside the hive in the summer. So why would we work against their efforts by opening a big hole in the roof of their hive and letting their cool air out? Bees increase water foraging in summer according to their cooling needs. Read all about it in Tom Seeley’s book Honeybee Democracy. Upper entrances and Imrie Shims are great for increasing honey production — but only for the 2 or 3 week intense nectar flow experienced in most locations. These techniques should only be employed for that very short period of time. The remainder of the year keep the top buttoned up. I know the traditional view is that ventilation is essential to reduce the build up of moisture. This is non-sense. Strong hives in hollow trees or bee hives have no difficulty controlling the moisture within the hive. If you say as do most beekeepers that they found a dead hive and it had lots of condensed moisture in the hive or on the inside of the cover, I will ask you flatly, did the water cause the bees to die? Or was the moisture a follow-on by-product of a weak and dying hive that could no longer control its own internal environment? This is like saying your grandmother fell and broke her hip. Ask her doctor and you will discover her hip broke and then she fell! Stop blaming moisture build up for killing your bees! Change to solid bottom boards. Change out bottom boards in the spring (like Brother Adam did every spring)! Keep the lids closed! Use upper entrances for major nectar flow only! Trust your bees to heat, cool, and ventilate their hives in their own way. Quit trying to improve on their system. Unfortunately hives die sometimes. Winter colony forensics are not easy, especially if you have not been in the hive recently to gather information on conditions. In a recent posting to a scientific beekeeping list server Randy Oliver from Scientific Beekeeping made the following observations. These are worth saving for future reference as no single book or source summarizes this information in so few words. Colony winter death forensic signs differ for different agents of death. With a pesticide kill, you tend to find dead bees all over the bottom board. Same for Chronic Bee Paralysis Virus. With a nosema kill, the sick bees will attempt to fly away to die, and a dead cluster may appear more disorganized. With a DWV (deformed wing virus) collapse, again, if days get warm enough for flight, the bees will fly/crawl off to die, and there may be very few dead bees in the hive. With tracheal mite winter kill, instead of a heads-in cluster, there will typically be dead bees fallen to the bottom or between the frames. their head in the cells, but no cells of honey within the dead cluster. Here is a front view of one of my cheap and easy bottom boards being used with an entrance reducer. The bottom board is made of treated 3/8s plywood, 1 by strips and re-purposed hardwood bottom plate from pallets. All these wood materials are soaked in a 50 – 50 mixture of boiled linseed oil and paint thinner. All exposed edges are coated in multiple coats of paint – after they have soaked up as much linseed oil as possible (and dried). Everything is glued and stapled together using waterproof TiteBond 2 or 3 glue. The parts are mass cut usually about 20 at a time. An air gun puts in the brads rapid fire. You can have the basic plywood bottoms custom cut for free at Home Depot or Lowes, then do the small work at home with your own table saw. (There is almost nothing wooden you can’t make for beekeeping using a table saw!) These bottom boards cost a fraction of the price of the ones you could buy in the beekeeping catalog and will last years longer. If you are concerned about using treated wood, please consider this: the treated wood is sealed away from the bees in multiple ways and manufacturers like Mann-Lake use treated wood as standard material for bottom boards. Check out these busy bees bringing in loads of pollen! This is the new beekeepers’ blog by Joe Lewis, author of Beekeeping 2.5 and numerous beekeeping articles and presentations in American Bee Journal, many of which center on Sustainable Beekeeping through Nucleus Colonies. I will use this site to make my materials and presentations available and to share ideas, tips, techniques, and practices to help you achieve your beekeeping goals, whatever they are. If you have an extra hour of your beekeeping life to spare, please watch one of my YouTube videos (like Beekeeping 357) where I share some of the cool things I have learned about bees during the last 11 years of intensive study and practice. Here I reveal some beekeeping trade secrets not likely to be found at your local club meeting! The photo above is one I shot on July 10, 2017 in Bel Air, Maryland where you can see some of my bees enjoying nectar and pollen from a Korean Evodia (evodia danielli) otherwise known as the “bee bee” tree. 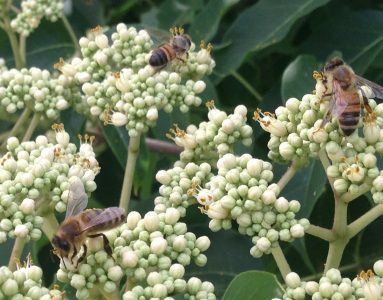 The bee bee tree is a source of nutrients for bees after the main nectar flow has ended in the Northeastern US. Gary Faucet from New Zealand’s Kiwimana Buzz gets Joe to reveal beekeeping secrets during podcast KM099.